Every time I hear a Bad Company song in some random place I am surprised. I seem to forget about that band and how much I loved their music. And then bam, I hear one of their tracks, and I am flooded with emotion – not quite nostalgia because who would want to go back? – but memories of that time, when I didn’t know anything but thought I knew everything. I wrote about I Tonya a few weeks ago, but I keep thinking about the soundtrack because it’s a cracker. It is full of tracks from the 1970s and early 1980s – before commercial radio was diced and sliced and when the music was either pop or rock – nothing else. So it’s not surprising that at least among my same-age-friends who have seen the film, one of the initial comments is “great soundtrack”. From Bad Company’s Shooting Star to Fleetwood Mac’s The Chain, Supertramp’s Goodbye Stranger and Dire Straits Romeo and Juliet, the songs selected both perfectly capture the cultural musical references of the movie’s time-setting, and give context to the story on screen. I am not sure what kind of deals are done around placement of songs on movie soundtracks – it’s probably fairly cutthroat – who even remembered Souixie and the Banshees did a version of Iggy Pop’s The Passenger? Ultimately, the music does its job in supporting the audience’s engagement in the film’s story, moving them through the emotional pathway of the story’s arc – the first time Tonya achieves the triple-axle jump in competition (Foreigner’s Feels like the first time) or Romeo and Juliet (althought I am not sure Tony and Jeff’s love was quite star-crossed). In many ways you could imagine some of these songs being written just for the movie, so perfectly do they match up. Margot Robbie (I, Tonya) is up against it for the Academy Award nominations for 2018 – Meryl Streep (The Post), Sally Hawkins (The Shape of Water), Saoirse Ronan (Ladybird) and Frances McDormand (Three Billboards outside Ebbing, Missouri) are the other nominees. All are worthy nominees, and as they say, being nominated is the honour. I have only seen I, Tonya and Three Billboards to date, and am struck by some similarities in the character depictions of the main female characters. Poor white women doing low paid jobs with no chance of an education, suffering serious and ongoing domestic violence (isn’t it all serious?). Their lives are affected by poorly educated white men whose portrayed stupidity and delusions of grandeur just get in the women’s way, and there’s no path around these men whose power is greater. With dreadful consequences. I, Tonya is the more successful movie of the two – despite the story being truly unbelievable. Developed as a script based on what might have occurred in real life (the opening intros are reliant on the Fargo-esque believe it if you can style) when Tonya Harding was at the top of the US ice-skating mountain, it hangs together far better than Three Billboards. McDormand carries that film with her portrayal of Mildred’s anger and grief, and we want her to get to where she needs to go – through the grief’s fire to acceptance. She almost makes it there by the end of the film, and that’s enough. But the supporting characters are somewhat sketchy, especially the female “ditzes”; and the Jason Dixon (Sam Rockwell) character is just too dumb for words. Has he really only survived so long due to the Sheriff’s patronage? This lack of worldliness and the insular nature of poor-town US is the theme that stood out most for me in these two films. When the FBI agent is questioning Jason in Three Billboards, and trying to let him know some details about a suspect, without betraying operational information, Jason’s lack of knowledge of US foreign policy shines through. Similarly, Shawn in I,Tonya lives in an imaginary world that allows him to hatch a plot and roll it out – as mind-boggling as it is – under the radar. How did they think he would get away with any of it? Too many episodes of #nameyourcopshow. And yet, they do get away with it – with dreadful consequences for Nancy Kerrigan, the skater supposedly in Harding’s way to glory and a gold Olympic medal. The real villain in I, Tonya is of course her mother, played stunningly by Alison Janney – all angles and sharp edges to match her tongue and even more cold anger, burning away inside. She reminds me of the buzzards that hang around in old Wiley-Coyote films, watching, waiting for the coyote to fail. But of course her machinations are what has put Tonya in this position in the first place, and if her mean-ness was anything like what is portrayed in the film, it’s no wonder that Tonya was desperate in her desire to prove them all wrong. Injustice is the other obvious theme – Tonya asks a skating judge why the competition can’t just be about the skating; and the sense of injustice that Mildred feels when the crime against her daughter remains unsolved is what drives her rage, as well as her own guilt, whether justified or not. (It’s interesting to compare wild-life officer Corey Lambert’s (Jeremy Renner) seeming sense of acceptance in Wind River, another US film about unsolved violence set in the context of crimes against First Nations women – many of whom are not accounted for in community records so the numbers of those crimes are under-reported. What do the Academy of Motion Picture Arts and Sciences’ members look for in a best actress performance: an emotional response to the character? Consistency? Physicality? A sense of being inside the character’s head? Believability? Both of these actresses pull this off (although Margot Robbie clearly trained hard to ice-skate for I, Tonya). And being up against Meryl Streep who’s in a film about press freedom – in the time of Trump – is going to be hard to beat. So I wouldn’t want to pick the winner. Why should we? They’re all brilliant. The series met my expectations and more – great writing and acting; sets were lavish and seemed real – I particularly loved the Devon cottage in Episode 3; as well as the luxury villas – who lives like that? And much has been written of the performances of the lead roles. What I particularly liked was that Olivia Coleman’s long-suffering, hard-working spy character could be pregnant – in years gone by that would have precluded her being cast. So, little gains are being made. But all throughout the watching, I have been haunted by the opening credits and the music accompanying it. There is some good information online (here and here) about how the makers approached fashioning what is often an overlooked scene-setter for any piece of film/video. And in these days of binge-watching, you can often skip through the credits. I found with The Night Manager, that watching the credits got me back into the zone each time, reminding me what I was watching, and through the emotion generated by the visuals and the music, set me up for the next instalment. The music is composed by Victor Reyes, and there’s also discussion on-line about its similarity to the opening credits theme for Westerworld, the production of which was also done by Patrick Clair. I can’t hear it myself, although I do agree that there are similarities, and the quality of the production values is the same. But The Night Manager theme is all ebb and flow, with minor crescendos to accompany the visuals as they change from the luxury item to an image of a weapon; each time dropping back to something safe before taking us somewhere dangerous – which follows the story-line of Pine’s journey. This matching of visuals and music is what makes the sequence so effective, to its ultimate end where everything explodes. Brilliant. There’s talk of a second series. Here’s hoping that if it is made, it will live up to the quality of this original in every respect, including the opening credits. Copyright of original source material is acknowledged. Yesterday I was a bit distracted by things sciency, so didn’t get to acknowledge World Record Store Day! Usually I would try to be at home and play records I haven’t played for a while. But better late than never. World Record Store Day is of course a marketing initiative, and has been going for over ten years now – how time flies! Although I haven’t bought any new vinyl for a long time, I have happily held on to my collection across many house moves, and through the advent of CDs and iTunes, despite the derision and scoffing of others. “The recording in digital is so much better, the sound production perfect,” I was told. “Records take up so much space …” Well, yes. But so does sports gear, or children, or books. While I can accept the arguments, that is not what it’s about for me. This is my collection (and I use the term loosely. It’s not a regimented collection as some of my former radio station colleagues would have built, with every record ever made by an artist, 45s and 33s). I do not have every album by say Fleetwood Mac (although we do have two copies of Rumours). I do not have every Elton John album. But I have what I like – such as Elvis Costello’s Imperial Bedroom, Kate Bush’s The Kick Inside, Blondie’s Parallel Lines, Flowers’ Icehouse, and Hall & Oates’ Bigger than Both of Us. The opening saxophone strains of their Back Together Again transport me to the adolescent bedroom in the inner suburbs of Newcastle, where the only knowledge of Philadelphia was the cream cheese sold in blocks in the supermarket. And that is what it is about – this music, the album covers, even the plastic sleeves from the record stores where I bought them – all contribute to a memory that is somehow tangible. I was there when I heard it. 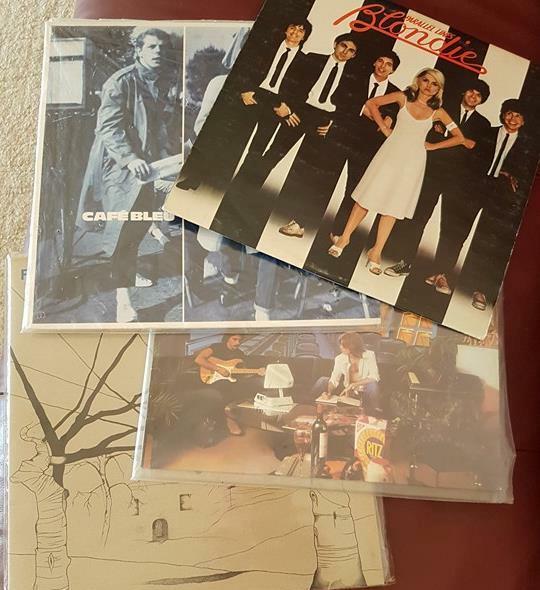 These pieces of rotating vinyl are the soundtrack of my life’s formative years, and it is not by co-incidence that when I am feeling low or disconnected, that I turn to this collection. Some have crackling and jumps (not too many), but it is those very imperfections that I like, remembering when I flogged a particular track or side, or why it jumps there. Sometimes I put a record on to be surprised by the tracks on a second side because I hadn’t ever flipped the disc. At the Patti Smith concert in Sydney recently, they were playing the whole of the Horses album live. After playing Free Money, she quipped wryly, “And that is the end of side 1 of Horses,” knowing that a large part of the audience would understand her reference. A 2016 YouGov study indicated that the recent resurgence in vinyl record purchasing is driven by midlife nostalgia. The research found that, “Those who have recently purchased a vinyl album are most likely to be aged between 45 and 54.” Ironically, many are re-purchasing albums they previously discarded. While there are some albums I can see myself discarding in the future – bits and pieces that I picked up along the way – playing records is such an important part of my life, I can’t ever imagine not having them. So I am glad for World Record Store Day – it means I won’t have difficulty getting a new stylus for the turntable (it was a bit tricky for a while in the 90s) for some time yet. Their Finest (and the novel Their Finest Hour and a Half by Lissa Evans, from which this film is drawn) takes its title from one of three speeches given by Sir Winston Churchill after the withdrawal and evacuation of troops from the beaches of Dunkirk in France during World War II. “Hitler knows that he will have to break us in this island or lose the war. If we can stand up to him, all Europe may be freed and the life of the world may move forward into broad, sunlit uplands. Their Finest is a 1940s period film about the role of propaganda, set within a story of people making a propaganda film. It explores how facts are manipulated to reach the end goal of validating the British government’s decisions and shoring up the public’s support for them, while at the same time making a film that tells a good story. It shows the political pressures that arise, the financial limits (and the seeming never-ending magic pudding of Ministry of War finances), and is set against the washed-out and dreary background of a London being bombed beyond recognition. Viewed through the lens of modern tenets of the role of women, the film can be viewed as feminist – the protagonist Catrin Cole (played by Gemma Artherton) has followed her socialist artist husband, Ellis (Jack Huston), to London from Wales. She walks into a screen-writing job because all of the men are off fighting. She is to write the women’s perspectives into the script, “the slop” (! ), and as she settles into it, she withstands Ellis’ pressure to leave her job and follow him to his next painting location – under the guise of them needing the money, which they do. But she also has found her passion and is not going to give it up. She’s already given up too much. There are stars aplenty in the supporting roles here – the wonderful Helen McCrory is under-used as an actor’s agent, but still looks glamorous amidst the grey restaurant and hospital scenes; and Bill Nighy, again playing a version of the naughty pop-star figure that brought him to the public eye in Love Actually, steals almost every scene. A bit too much ham, although his scenes with Catrin are moving and genuine. Richard E Grant is subdued but strategic as a senior bureaucrat, and Jeremy Irons is the Secretary for War – very Anthony Eden in prep and presentation. Catrin is supported at work by screenwriter, Buckley (Sam Claflin). The background stories in Their Finest help to anchor the viewer – there’s more than enough to keep us interested. And the film they make is ultimately shown to be very effective in manipulating the public’s support for the Churchill government’s actions. However, the real value of Their Finest is in reminding us how and why this is done -and should be a warning in this re-emergent age of fake news. I am standing in a dark cupboard – about the size, shape and build of a polling booth. A black curtain is pulled closed behind me. On either side of me at waist height are two plastic arms, elbows sticking out, attached to the wall. Apparently they are meant to move and jostle me around, as if we were standing in the audience of The Antler hotel in Narrabeen in the late 1970s. But the elbows remain static in the dark, inversed Vs, props in some weird Halloween party. In front of me is a largish screen playing a video of a Midnight Oil gig, circa 1982 – and the elbows are irrelevant because I don’t need reminding what a Midnight Oil gig is like. I do remember. The Making of Midnight Oil retrospective exhibition is in Canberra at the moment at the Tuggeranong Arts Centre and is well worth the hour or so spent down memory lane. First mounted by the Manly Art Gallery and Museum in close consultation with Oils band members, the exhibits cover the life of this iconic Australian band, from its genesis as Farm, through to the early 2000s when they wound up shop. There is plenty of video content to see, as well as clothing, tshirts, album covers, 45s (! ), and a stage set up complete with drum kit. The height of Peter Garrett’s microphone stand gives an idea of the size of the man but I suspect they would have needed more room on a real stage to accommodate him, his movement and dance style, and three guitarists as well. The first time I saw Midnight Oil was at The Ambassador nightclub in Newcastle. I was 16 (checking ID wasn’t much of a thing in 1979) in year 12, and had convinced my friend Melanie to come with me. I didn’t see much of her that night, but she knew where I was if she needed me. I didn’t move from my perch on a stool at stage right, mesmerised by the driving energy of the sound and, if I am honest, Rob Hirst’s biceps. Yes, Garrett’s presence was overpowering too, but it was the music that stayed (and stays) with me, and I straight away ordered Head Injuries from the CBS record club – a well-loved piece of vinyl that I retain today. By the time I moved to Sydney the following year (and eventually to North Bondi the following year ), they had taken off and were playing all over the place. The exhibition is very comprehensive – it tracks through the key pinch points of their career – the Oils on Water Triple J concert on Sydney Harbour (somewhere in the garage I have a cassette tape of this, recorded from the radio), endless tours in the US, travelling and touring through the Australian outback – unheard of in the 1980s, the Sydney Olympics and the Sorry suits – politics was never far away and it’s fair to say that it was not the sole province of Garrett. He’d have been given short shrift if the agenda were only his and this comes out in lyrics written by all of the band members. The high points of the exhibit for me are the personal items on display – the guitars and drum sticks, the Casio keyboard used for song composition, and a tattered set list left over from a gig – perhaps kept by chance but encapsulating the band’s life-time output. And the handwritten lyric sheets – complete with copyright tags – are fabulous to see. The film of the making of the 10-1 album is also running on a loop, and features interviews with the brilliant Jim Moginie and producer Nick Launay and illustrates the technical brilliance and musical knowledge that sits behind the unique Oils sound. The exhibit will be touring elsewhere in regional locations, which is great, but if you are in or around Canberra, I can recommend it.